If you haven’t heard of this game or played it, you missed out big time. This was a Super Nintendo gem that my brother and I (well my parents) rented many times. 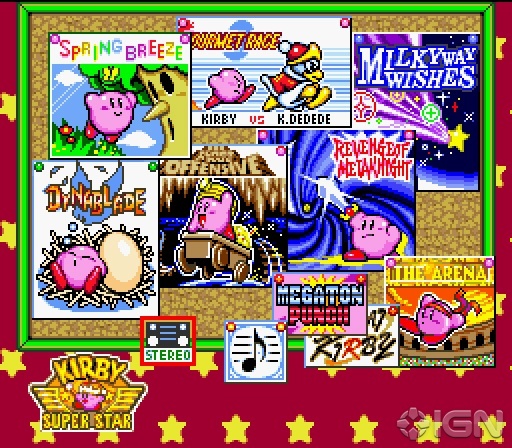 The premise of the game was similar to Mario All-Stars in that it was made up of many different Kirby games in one. The great thing about this game was that it was a co-op two player game, which meant a lot of fun with my brother. I would usually end up playing Kirby and my brother would be the sidekick (as it should be for little brothers) and we made a pretty good team. We spent hours playing together and trying to collect all the treasure in the expansive treasure hunting game, or racing against the clock and Meta Knight in his “Revenge of Meta Knight” game. I tried buying this game a few years ago at a game shop, and it still a fairly expensive game. I think I saw it for $40 which means it’s probably an uncommon find, especially paired with its popularity. The daunting list of games. The Great Mine Offensive takes the cake for best game. This game has a lot of awesome memories attached during my younger days. My brother and I would play this for hours trying to beat all of the games. I never achieved 100% completion on this one, but some day I will have to pick it up again and give it a shot. As much as I love this game, it will not be the same playing it solo, or even with someone else.